On June 7, 2011 when the ArtistWorks Academy of Bluegrass launched into public web space with Mike Marshall heading the School of Mandolin, months of careful planning, preparation, curriculum design, video editing and the back-end for a new kind of web-based mandolin experience moved from concept into musician homes world-wide. While the web had always promised great educational content delivery in music instruction, ArtistWorks appears to be the first to really grasp and exploit the possibilities in a user-friendly manner for the acoustic music market. Led by David Butler, a former high ranking American Online managing programmer when AOL was at its peak, ArtistWorks is rapidly moving forward adding not only new members to their subscription base, but opening in new areas of music while existing schools expand their digital libraries. Yet questions about ArtistWorks routinely come up in web forums (this one included) that deserve to be answered in greater detail. There would be no better way to get an inside look than going straight to the source, so the Mandolin Cafe caught up with Mike a few weeks ago while he was in Germany performing and rehearsing with Caterina Lichtenberg — and simultaneously answering student inquiries within his School of Mandolin — where he gave us an ArtistWorks view from an instructor's side of the equation. School of Mandolin subscribers are presented with this screen upon logging in. Mandolin Cafe: It's a web site with videos, a forum and a login. How is the School of Mandolin different from what's already available to anyone with a web connection? Mike Marshall: ArtistWorks has created a completely unique way of learning music. You have to toss out your ideas of normal music lessons with a teacher you see every week or what happens when you buy a DVD of instructional lessons or the sprinkling of home grown videos that appear on YouTube. This is completely new way to learn music. It's a hybrid between a DVD, a traditional private lesson and a master class where you learn by watching others take a lesson. There are basically two main parts of the ArtistWorks website learning experience. One is the hundreds of hours of lessons which they filmed of me in the ArtistWorks studios in Napa, California. There are approximately 175 short lessons available for subscribers to watch. This is a constantly growing library of tunes and concepts because I can film at home at any time if a student requests something or if I just feel like putting a new tune up. It is a complete curriculum from the absolute beginner mandolinist who just bought an instrument all the way up through intermediate and higher level advanced things and I try to cover as wide a range of styles as I can. These videos are all shot with three cameras and we offer the ability for students to slow the video down for easy learning and of course there is music and tablature to all of the pieces. All tunes have a backing track of me playing guitar at three different tempos so when you send me a video you can choose what speed you want to play the tune at with me as your guitarist. The second is the ArtistWorks Video ExchangeTM. This is a completely voluntary system. If someone sends me a video, I watch it and then submit a response video. These two videos stay permanently linked and are posted in the Video Exchange library so the entire community can learn from it. It's a traditional master class method of teaching, but it's online. Any subscriber to the School of Mandolin can watch any of these video exchanges. If you are interested in a particular tune you can browse the library and see if anyone has submitted it. You can watch the student play the tune or exercise and then you can see what I had to say about it. This is what takes place in University Music Departments every day around the world, but here it's recorded online and can be appreciated for years to come. I am finding it an amazing way for people to learn. From the student's perspective, you are getting this absolute one-on-one kind of attention to your particular problem and all of the issues that pertain to you personally addressed. From my perspective, I only have to zone in on that student's main issue right at that moment and say it that one time, and then the student can watch that video as many times as they like and keep getting more from it. So for me it's a very efficient way to share my knowledge rather than having a student show up at a lesson each week and maybe a bit nervous and not play up to the level that they could, and then have to hear me say something again that I said last week. It is a real leverage of my time, too. I say it, and they can listen to it and watch it over and over again and get pieces of it a bit at a time in the comfort of their own home, and the student can digest this stuff at their own pace. I'm finding this might actually be a better way of learning for some people than a traditional lesson. And I should also mention that this one-to-many approach allows the students to get a lifetime of lessons for less than the cost of the single lesson from the guy down the street. Mandolin Cafe: The video submission process must be nerve racking for some subscribers. What kind of traffic are you getting there? Mike Marshall: I believe we are close to 500 video responses to date, and that's after only one year. There are many really amazing submissions and I think players of any level would benefit greatly from watching these video exchanges. It's just timeless stuff that we will be building on for years to come. I've got folks who just started out and maybe bought a mandolin last week. You know, I actually love being able to help someone at that moment because as we all know, if you develop bad habits early on, they are really hard to break later, right? Then we have the usually middle ground of guys and gals playing lots of bluegrass tunes and fiddle tunes and asking all kinds of pointed questions from... "How do you really get a good chop sound playing rhythm on a mandolin in a band," to "How can I improvise on this bluegrass classic?" "Can you give me some new licks to play on this tune?" Or sometimes they just submit a tune that they are working on. And since they know it's me, it can be from almost any genre. Bluegrass, Swing, Classical, Brazilian... whatever. I welcome basically anyone to send me anything they would like and I'm willing to help them if I can. I haven't been stumped yet ;). As far as numbers go, all I can say is, the site is growing very fast. I've got students signing up from all over the world as you might imagine and people are able to meet each other through the web site and make connections so it's a very cool to watch this thing unfold. People join every single day. And the feedback has been tremendous. Not only for my own teaching and ability to help people learn and get a little better pretty quickly, but also I'm trying to create a really welcoming atmosphere where students are not afraid to just put themselves out there and let me give positive criticism and help everyone see how they can improve. It's a safe place on that level. The only thing students usually struggle with is getting a good enough version of the tune for them to send it to me. But you know that in and of itself take care of a bunch of the things. When you watch yourself play something and think, let's see, how does that sound? Is that good enough to send to Mr. Marshall? Then many of us say, no way, and go to work and make a bunch of corrections on our own. By the time I see something it has already come up a few notches usually. Some students jokingly say "OK, this is take 63!" Mandolin Cafe: What topics are you covering? 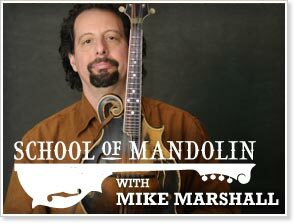 Mike Marshall: As far as a list of topics goes: I would say it's hundreds of details about how I think about the mandolin and music in general. It's my life's work on this website. From how to hold the instrument and what your whole body is doing to how to play simple rhythms and melodies to more complicated tunes or how to improvise on fiddle tunes and not lose the melody to playing over complicated chord changes and on and on it goes. It's all there. Or if it's not, it's going to be added to as time goes on, and the lesson database will just get larger as the years pass. Mandolin Cafe: Was the curriculum all Mike Marshall, ArtistWorks or a combination of both? Mike Marshall: The curriculum was created based on my own experience as a teacher and player for over 40 years now. I used to teach back in Florida even before I graduated from high school and moved out to join the David Grisman Quintet in 1978. So it's something that I've always had a hand in and was interested in. Then about 10 years ago David and Chris Thile and I started the Mandolin Symposium in Santa Cruz, California, which has really given me some insight into that type of educational format. I've produced three DVDs for Homespun Tapes and produced five or more of my own instructional books where I've attempted to gather my thoughts on everything from basic technique to how to play Bach on the mandolin. I even published the Rafaelle Calace series of his six-volume mandolin method from 1910 and continue to give workshops all over the world. As you know Caterina Lichtenberg, my very significant other, is one of the greatest players and educators on the mandolin in the world so the conversations around the house can tend to be a lot about this subject. I think what viewers are getting when they send me something is probably all of that experience, not only teaching but of course all the years and years of playing with so many different kinds of musicians and styles of music. Mandolin Cafe: From start to launch you must have spent a great deal of time creating all of this content. Mike Marshall: I started talking to the company in January of 2011 and by June we were launched and up and running. Of course during the recording days in the studio David Butler (co-founder and CEO) was there and really helped me stay focused and would steer things in the right direction and keep me on track so it was somewhat collaborative once in the studio but the basic curriculum is all mine. We spent six days (9-10 hours each day) videotaping the lessons. It was a tremendous job to say the least. Like producing six or seven DVDs in a week solid. I'm very proud of what we put together. There are about 175 individual short lessons up that students can watch. Matt Flinner did a bunch of transcribing for us so we have the music and tabs available as well. Prior to coming up to Napa, I spent a few days in my own home studio prerecording three tempos of rhythm guitar for each tune so players can play along at whatever tempo feels good to them. Mandolin Cafe: What percentage of subscribers would say actually submit videos for evaluation? Mike Marshall: That's a hard one to answer only because it doesn't give an accurate picture of what is going on. Some people never send in a video at all and other folks will send in one every week or two. It's just a wonderful environment and I like how the students are really supporting each other on the site. There are places for people to comment on each other's submissions so people are really cheering each other on and creating a really nice vibe on the site no matter the level. Students can upload videos of their groups onto their own student pages and there is a shout out box on the front page that is full of activity and lots of fun chatting going on. I've done a few live chats too which are kind of fun. So it's generally a pretty cool place for mandolin players to hang out. Mandolin Cafe: Do you personally monitor the forum discussions? Mike Marshall: Yes, I check that pretty regularly and there is an "Ask Mike" section which I respond to whenever someone asks me something specific. Mandolin Cafe: We imagine you probably run into your own support issues with the technology. How does that work for you? Mike Marshall: The ArtistWorks folks and all their employees are just amazing. David Butler is the co-founder and CEO and Patricia Butler is the President. David was one of the managing programmers at AOL at their peak as a company. At one point he had almost 400 programmers working under him. This is someone who really knows about computers and the internet. Their team of employees are all top notch and do NOT miss a trick. If ever there is an issue with someone's video not uploading or if I am having any kind of problem with something, these guys are on it and have it fixed and up and running in a matter of hours usually. You know how tricky dealing with tremendous volumes of data over the internet can be, but the team at ArtistWorks is creating a smooth environment for all of us. ArtistWorks Academy of Bluegrass teachers Missy Raines (bass), Bryan Sutton (guitar), Mike Marshall (mandolin), Tony Trischka (banjo) and Darol Anger (fiddle) in performance at RockyGrass 2011. Mandolin Cafe: The Academy of Bluegrass wasn't their first music venture, correct? Mike Marshall: They started out with online jazz lessons. Tony Trischka was their sole Bluegrass artist. When I signed on they created the Academy of Bluegrass which in addition to Tony includes Bryan Sutton on guitar, Darol Anger on violin, Andy Hall on dobro and Missy Raines on bass. It has since expanded to areas beyond bluegrass and rock and mainstream instruments. Their goal is to help players enjoy music by improving their skills and collaborating with skilled masters as well as their peers. They are creating schools for all of the instruments of the orchestra. Their Jazz school has just expanded to include John Patitucci, Luis Conte and Billy Cobham. There are some other things that are in the developmental stages that when they get launched will make this experience even better. It's a very creative bunch of folks who are always thinking of ways to make things run more smoothly for both the students and the teachers. They listen and take seriously student and teacher concerns and creative ideas. Mandolin Cafe: What's been the best part of the experience for you and some observations of the kinds of problems students are up against? Mike Marshall: I just love to see people getting a little bit better and learning something new at whatever level they are. The site has been going long enough now that I'm seeing good results. If they do the little things I suggest, the players actually get better and that's been very encouraging. One of the things that I realized about our little instrument is that there is not an agreed upon idea of even how we are suppose to hold the thing. If you go and take violin lessons in almost any city in the world, there is an idea of how you hold the violin under your chin. You use a shoulder rest and hold the bow like this... right? As mandolin players we are still stuck in this folk realm of, well... you just kind of pick it up and go for it. Or, I hold it like my hero did in a photo. Or people just kind of just do their own thing. It's like the old fiddlers who held the fiddle down on their chest and chocked up on the bow many years back. They could maybe do one or two things really cool like that, but of course there were going to be limitations, like shifting up into higher positions. I spend a little time with each person looking at what's going on with their whole body and how can we improve these basic things. The other thing that I'm noticing a lot is pick direction. It's a surprise how many folks are playing with very unusual pick directions depending on where they are in the beat. I subscribe to the idea of Down Pick on the Down Beat and Up Pick on the Up Beat. But this can get really turned around for many people because they are sending the pick in the direction of the next string instead of to the beat of the music. So I'm putting a lot of time into helping people understand these basics. One of the neatest submissions was a fella who was playing with a click track but he wasn't really with it at all. It was just kind of on in the background. So I got him to slow down and just play open strings in a series of exercises where I got him to really lock in with the click. His next submission was dead-on. This was pretty exciting for me I must say. Now he's swinging pretty good on this stuff. I think for a lot of us, it's a question of just awareness. If some teacher can point something out to you and you become conscious of it, then you can usually fix it yourself with time. But many of us play and are not really thinking about these details. Or we have trouble doing our thing while keeping track of something else that's going on around us. Mandolin Cafe: Is there a median student age group? Mike Marshall: We of course have some cuter than can be believed young people who are just doing wonders and ramping up fast. I often think about how lucky I would have felt if I could have had Sam Bush or David Grisman helping me when I was 13 or 14. That might have saved me some serious time don't you think? These kids are going places... let me tell you. There are also some entire families on the Academy site where dad is taking guitar from Bryan, mom is doing the bass with Missy and little brother is my mandolin student and the sister is playing fiddle with Darol over there. Most all of our students are adult players though. Pretty cool, huh? I want to just add that I really do enjoy teaching. I feel a kind of responsibility to these players and I really enjoy the process of trying to figure either what to say to someone or how to demonstrate to them in a clear and concise way how they can improve or build on what they already know. Sometimes someone will send me a submission and I will have to spend a few days really thinking it over how I'm going to respond to their issue. It might be a tune that I have never played, so I'll spend some time learning it myself which is actually great for me! Or it might be something that person is struggling with but I need to really find the right words to help them. So this delay time between submission and response can have positive effects that none of us had anticipated. I have this one guy that sent some Beatles tunes. He's playing them solo pretty much. So last week he sent me Girl from Revolver with just the A section worked out and the rest were just the chords. So I really had to spend some time working something out for him. He had it in Em and I moved it back to the original key of Cm and really was able to play the whole dang thing, melody and chords and all. Even George's solo! So I got a bunch of forum notes from folks who are all just diving into this crazy arrangement and learning it. That's the kind of stuff that goes on all the time. There's a guys from Spain who's turning us all on to the Celtic Spanish music of his region. Then there are some cats playing Bach on mandocellos who are pretty darn good too, so it's all pretty encouraging. Mandolin Cafe: This is a very serious long-term commitment. How have you balanced the Academy responsibilities with your busy touring schedule? Mike Marshall: You know the coolest thing about this way of working is that I can do these responses whenever and wherever I am. I can be at my home in Oakland or over here in Germany or in a hotel some place on the road. It's this kind of flexibility that has enabled me to work it into my life in a way that works. I can let a week go by if I am really jammed with something and the students understand this. I communicate with them and explain what's up, but basically I try to not let more and a week or 10 days go by after someone has sent me a submission before I give them a response. So far, so good on mixing it in with the rest of my life as a musician. And that same concept makes it great for the students too. They obviously are busy and this self-paced approach with video lessons and video exchange in non-real time makes it possible for the students to undertake something big and amazing at a pace that works for them. Mandolin Cafe: You've been an advocate for a more formal educational model for American mandolin music like Germany has. Would you call this the start of such a system? Mike Marshall: Of course I would still like to see this style of music being taught in a University setting with all the other instruments and styles of music happening all around and at a very high level. There should be a place for that and one day I believe there will be. ArtistWorks is paving the way for the next generation of players to be ready for that, which is for sure. I am just very excited about what is happening here at the School of Mandolin. It will be up to me and for the students and ArtistWorks to steer this new concept of learning in the right direction. Maybe that's what's so exciting about it. We can make this thing into whatever we would like it to be. There is no fixed model holding us back. It's a very American concept and we will see how far we can take it. I already have a few students who are earning college credit by taking my online classes. So that's a step in the right direction, right? Anyway, it's a fun place and I hope to see more folks there soon. The School of Mandolin has become a fixture in my relationship with this instrument. It's an essential resource, always there, whether I logon to reconnect with rusty techniques or concepts or to learn something entirely new. Between the structure of the lessons, the freedom inherent in Mike's approach, the sense of accomplishment from recording submissions (he is absolutely right about how much learning comes from those multiple takes! ), and the excitement of seeing what he brings to any tune or piece and how he thinks, it's a pretty incredible intersection of technical potential and human purpose. Bravo indeed! Sounds incredibly cool. Question: just to be clear, is your emphasis landed in bluegrass? I know it sounds crazy but there are some of us out here working on Brit folk/rock with zed interest in the bluegrass genre, but still looking for quality instruction. I see you are helping some folks with different styles of music in mind. Sorry if I am asking something you've already answered. Mike is really a talented teacher/musician....I've been doing this since last August and it's been a incredible resource for learning the Mandolin! Quote from goldendeer: Sounds incredibly cool. Question: just to be clear, is your emphasis landed in bluegrass? I know it sounds crazy but there are some of us out here working on Brit folk/rock with zed interest in the bluegrass genre, but still looking for quality instruction. I see you are helping some folks with different styles of music in mind. Sorry if I am asking something you've already answered. I love all styles and music and welcome anyone who is interested in the mandolin to please join and see what we can do together. Just wanting folks to get a little better at this mando thing. Okay, this interview pushed me over the edge. I'm hoping the time shifting possibilities will help me (I'm so crazy busy with an undependable schedule). I signed up last night. One student sent in a nice version of "Sweet Georgia Brown"...........Mike's response video is quite long and detailed, he showed how to swing the chords, in several places on the neck.......moves from melody into improv ideas, etc. It is like a basic lesson, but with enough nuance and detail that you can go back again & again to get more info and other ideas for how to think while playing ...... concepts an advanced beginner can handle, but more involved ideas that get a more proficient player thinking......it is fabulous that this remains on there as a tutorial for the tune. These videos have something for every level player, even if just to see what you need to start thinking about as you gain more experience. There is everything from the Beatles, to Bach, to Bluegrass, as well as traditional fiddle tunes, and on to the frontiers of New Acoustic music on there........add in some complex jazz chord lessons & swing tunes......are you into Choro?.....or bigger mando family instruments? ...whatever students have sent in Mike has given a thoughtful, well taught response, in any genre. Keep 'em coming Gator!!! Great job of responding to what has been sent in. I'm digging it, and like Larry says above it is archived on there, so no matter what your schedule is, or where you live, Mike Marshall is available......no lines, no waiting! Not only is the man insanely genius at many styles but he has the innate ability/ talent for teaching this stuff to folks at any level. From blues, to rock, to Bach...his style is relaxed and totally engaging. Many thanks for all the prep that goes into your responses to the vids, MM! Welcome to the cafe Mike and congrats on what looks like a great teaching model. See you in Santa Cruz in late June. Keep an eye out for any future live online workshops with Mike. The last 2 provided viewers with a discount code for joining Artistworks. I was able to get a 20% discount from watching the Mashup back in March. But you have to watch the sessions within 24-48 hours because they only offer the discounts for a short period of time. I purchased a 1 year membership and am really enjoying working with Mike. I still can't believe that I get to learn how to play the mandolin from one of the world's best mandolinists. 1. Mike's lessons are not exclusively bluegrass. He also does some folk, old-time, Irish and blues in the beginner and intermediate sections and gets into classical and choro in the advanced sections. 2. Even when Mike teaches bluegrass, he uses it to illustrate universal techniques he is trying to teach. Any player will benefit from learning these things, even if bluegrass is not their thing. 3. Mike encourages students to submit videos of whatever they are working on. It does not have to be something in the curriculum. A lot of students do this. If you want to submit videos of you playing Brit folk/rock, he will critique them and give you advice. I cannot imagine there is a genre that Mike cannot handle. Seriously though, I would do it if I had the spare cash. Although I am competent at what I do I am probably limited in scope and certainly could benefit from his guidance and experience... I suspect that if effort is applied it is a real confidence building experience. Just watching the few videos of him, I like his style.